As of writing, $BTCUSD has dropped over 78% from its ATH and is now sitting at $4,231.67. The crypto market is experiencing sheer pandemonium. I have lost roughly 90% of my actual crypto portfolio, yet I am not crying (too much). This current market climate in crypto inspired me to write about the capitulation that we are experiencing from another perspective. Now, let’s contextualize the losses that we are experiencing. In the beginning, diversification is imperative. Once you get your feet wet and have confidence in your investments, you can adjust your portfolio accordingly and make bigger bets on specific asset classes(Ref 4). Crypto, in relevance, was a new industry entirely. Some will argue that the market itself has yet to reach maturity after a span of 10 years in existence. Trivial arguments aside, we know for certain that the industry was new, therefore, we should have approached investing with that in consideration. The damaging effects of placing all of your eggs in one basket can be magnified if proper risk management is not taken into consideration. Investing is a strategic analytical game of probability. Imagine an array of investments displayed on a bell curve. Majority of the investments can be deemed safe and yielding low returns or low losses. If we navigate towards the extremities of the graph we can see a total loss of portfolios or its counterpart which is massive gains. You can “go all-in” while investing blindly; still have a probabilistic chance of hitting the “lottery” but 99:100 you will lose some or all of your money (Ref 5). This is where we introduce diversification. I call this a “pray-and-spray” method of investing. This will help you stay above water when markets go against your favor. 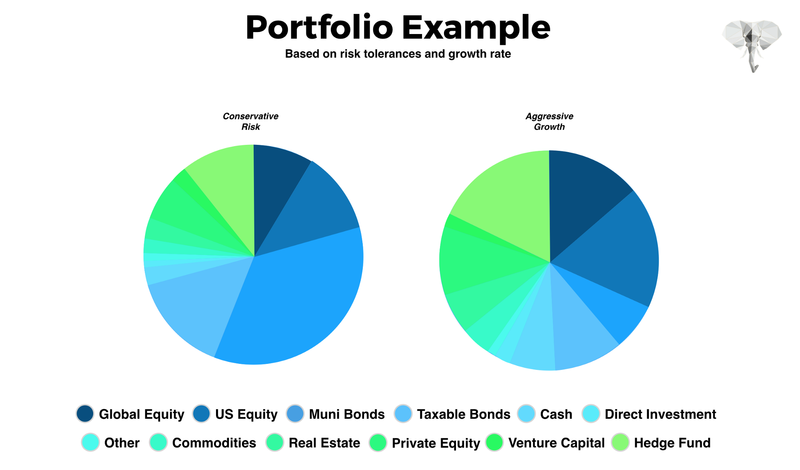 Diversification is a risk management technique that mixes a wide variety of investments within a portfolio. 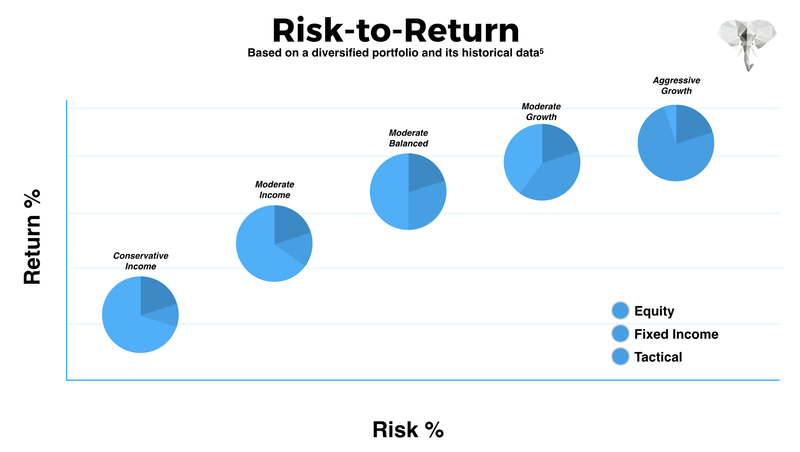 The rationale behind this technique contends that a portfolio constructed of different kinds of investments will, on average, yield higher returns and pose a lower risk than any individual investment found within the portfolio (Ref 1.). Simply put, diversification is a solution that provides maximum upside while mitigating the potential downside. This is where a portfolio consists of various asset classes such as, but not limited to, stocks, ETFs, Mutual Funds, Bonds, Real Estate, Private Equity, Crypto, etc. To mitigate overall investment risk. Let’s go back to our intro. I lost ~90% of my crypto portfolio, yet I am not crying (too much). Proper risk management(“RM”) would prevent the overall state of melancholy, but proper RM with a diverse portfolio means I still have an upside and not all of my money has been washed. Let’s create an example to better digest what I mean. Below an example of a diversified portfolio. We notice that some assets are producing positive gains while the other are yielding a negative return. Overall, the assets returns are aggregated and we result in a positive gain of $3,245.00 over x-time. Now, let’s create a scenario where this portfolio balance ($140,000) was placed 100% in the company “Bitcoin”. If the Price continues to depreciate the portfolio will result in a major or total loss. This proves to be problematic for investors who are attempting to achieve the opposite effect (REF 3). This is why we do not place all of our eggs in one basket. Although I call diversification a pray-and-spray methodological approach to investing, it is anything but that. I personally distribute my investment portfolio according to the risk: reward ratio that an asset class provides. Some assets are more aggressive than others, which inherently means that they are also much riskier. Personally, I am an aggressive investor, seeking higher returns. However, I am systematic with my strategy so that I still mitigate losses by taking advantage of proper risk management. Every investment isn’t equal; some assets inherent more risk while others are safer, each associated with more or fewer gains, respectively. Circling back to crypto, we experienced an emerging market with a retail boom and bust. As an aggressive investor myself, I placed more of my total investment portfolio in new industries such as crypto. I allocated ~10% of my investment portfolio in newer markets and divide that 10% between various assets, like crypto. This prevents me from losing the total amount of my portfolio while still being able to experience massive gains. Lastly, I want to discuss the time period of holdings. Some assets, usually the “safer” ones, are expected to be held longer vs the more volatile assets like crypto. Knowing when to get in and out is just as paramount as knowing what to buy in the first place. This is where learning technical and fundamental analysis can prove to be extremely beneficial. Just because crypto hit ~90% losses does not mean my net P/L was negative. However, few empirical research studies suggest that a diverse portfolio has a higher probability of becoming risk adverse rather than increasing the probability of a positive output (Ref 5). Risk management for preventing losses is superior to the most diverse portfolio. Diversify your total investment fund into various assets classes with ranging risk-to-reward. This is something that you should discuss with your financial advisor (if they haven’t already done so). We recommend that you continue to research what is best for you, and possibly use this article as a part of your research. The empirical data does suggest that a diversified portfolio will mitigate risk but a more profitable portfolio using S&P as a regression reference point would be a simple mutual fund. How to build a diverse portfolio? Once again, this is a VERY personal question that varies based on multiple different variables such as goals, income, the amount you have to start, risk tolerance and more. We suggest you consult your financial advisor or wait till we build our Robo-Advisor which automatically reallocates and tax harvests your portfolio based on your individual needs. The technology will use sophisticated algorithms and predictive models constructed by empirical historic data with artificial intelligence and deep learning. Nevertheless, we can illustrate an example portolfio by explaining our approach. We can revert back to our [FIG 2] and extrapolate on that. Let’s consider 2 risk tolerances: Conservative and Aggressive. Now, how much of your income or savings should you decide to invest in a portfolio is a topic on its own. Just as everything else, we recommend that you consult your financial advisor to assist your tolerance and give you a suggested allowance for investing. Ref 1: Staff, Investopedia. “Diversification”. Investopedia, 2018, https://www.investopedia.com/terms/d/diversification.asp#ixzz5YHFflGlx. Accessed 1 Dec 2018. Ref 2: ANTONCIC, BOSTJAN. “IMPACTS OF DIVERSIFICATION AND CORPORATE ENTREPRENEURSHIP STRATEGY MAKING ON GROWTH AND PROFITABILITY: A NORMATIVE MODEL”. Journal Of Enterprising Culture, vol 14, no. 01, 2006, pp. 49–63. World Scientific Pub Co Pte Lt, doi:10.1142/s0218495806000040. Ref 3: Staff, My Accounting Course. “What Is A Diversified Portfolio? — Definition | Meaning | Example”. My Accounting Course, 2018, https://www.myaccountingcourse.com/accounting-dictionary/diversified-portfolio. Accessed 1 Dec 2018. Ref 4: Goetzmann, William N., and Alok Kumar. “Equity Portfolio Diversification*”. Review Of Finance, vol 12, no. 3, 2008, pp. 433–463. Oxford University Press (OUP), doi:10.1093/rof/rfn005. Ref 5: Lintner, John. “SECURITY PRICES, RISK, AND MAXIMAL GAINS FROM DIVERSIFICATION*”. The Journal Of Finance, vol 20, no. 4, 1965, pp. 587–615. Wiley, doi:10.1111/j.1540–6261.1965.tb02930.x.